Fearful Symmetries: No Love For Madison From Obama? No Love For Madison From Obama? Just as I posted my plea for convenience when it comes to passenger rail in Madison, I hear that President Obama announced his plan for high-speed rail in America. The Capital Times is loudly proclaiming that Madison is part of the president's vision as spoke in the Chicago Hub Network, 1 of 10 rail corridors that his plan aims to fund with an initial disbursement of $8 billion with another $5 billion over the next five years. 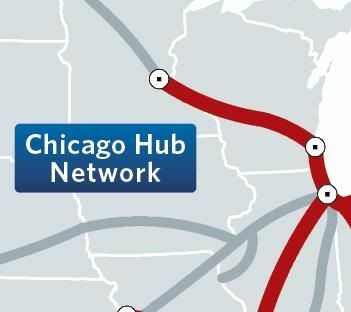 The Chicago Hub Network will use its namesake as a point of departure for trains going to Milwaukee, the Twin Cities, St. Louis, Kansas City, Detroit, Toledo, Cleveland, Columbus, Cincinnati, Indianapolis, and Louisville. Presumably Madison would be on the route between Milwaukee and the Twin Cities. Presumably this map just shows primary routes and not all of them. Regardless, what I see is the current route of the Empire Builder getting some track upgrades to accommodate trains traveling at higher speeds than they do today rather than Madison's inclusion in the Chicago Hub Network. However, I would imagine that formulators of any project can submit an application for funding whether or not it's one of the Fed's favored corridors.